You could surmise I have something of a Walmart phobia. I wouldn’t exactly say I was traumatized by past experiences in Wally Land—at least not to the point where I really should be seeing a shrink—but perturbed enough that I haven’t ventured inside of one even when it was the only vender open past midnight, or (for years) was the closest big box store to where I live. In fact, I haven’t been in one since the “We, the People of Walmart” adventure in Pahrump, Nevada last year—and that was only because of Alene, who needed to stock up on a few hundred dollars worth of supplies before her double Badwater-Death Valley crossing. Suitably, then, the next time I’d be in a Walmart was also with Alene. This time it was for her forty-something birthday. 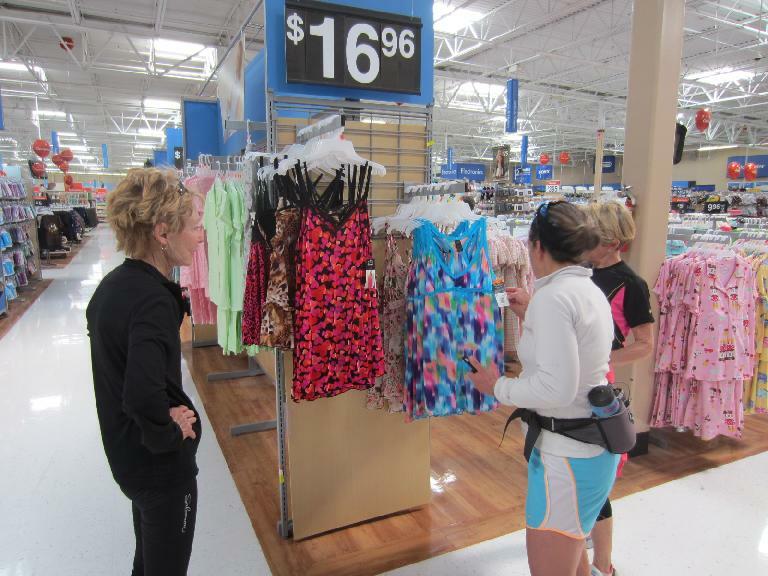 She was doing her very own Tour of Walmart, which entailed running from Walmart to Walmart to augment her colorful clothing wardrobe and run 48 miles. How many Walmarts did she end up going to? FOUR! 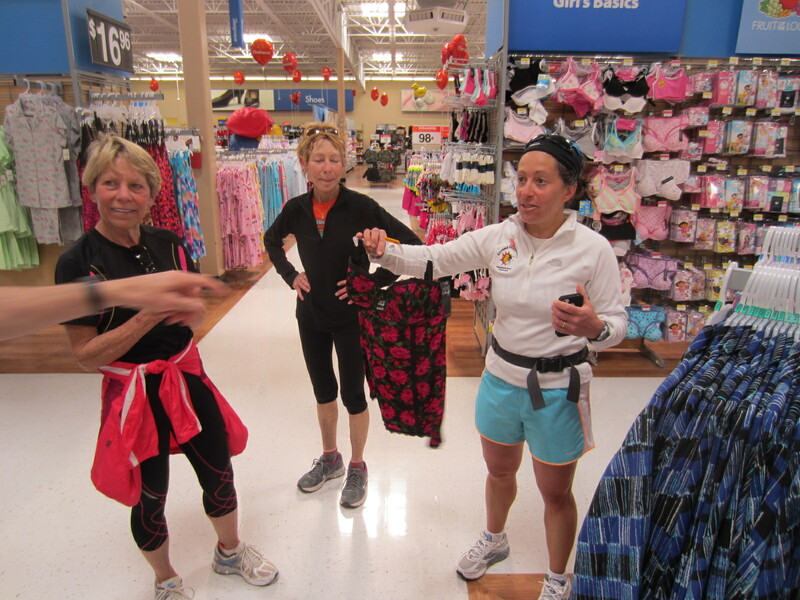 I joined Alene and Cathy, Dennis, Ginger and Tom at Walmart #2 (one in Loveland, which I believe featured the protest documented in the movie Walmart: The High Cost of Low Price). We swerved around the wallowing Walmartians to look for brightly colored tops and dresses that, ideally, could complement the camouflage bra she picked up 7.5 miles ago at Walmart #1. Then, when it was time to check out, Alene had an unearthly sense of déjá vu. 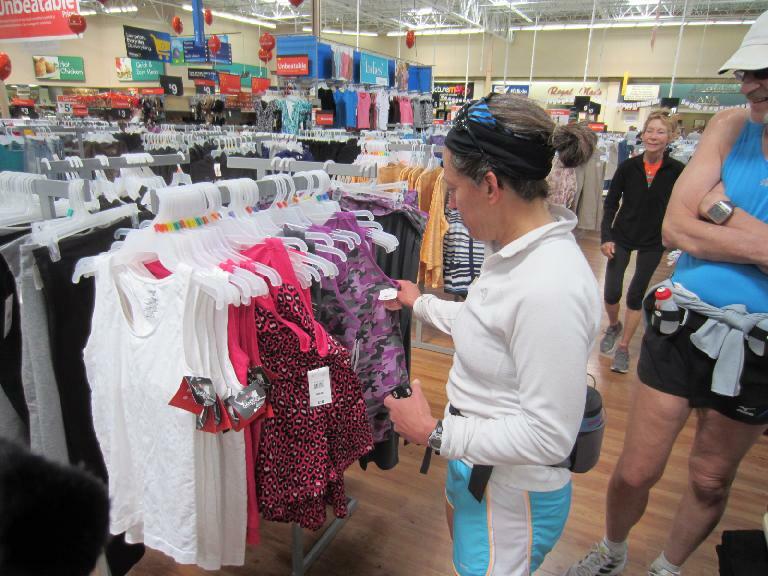 “The checker,” she later explained, “looked EXACTLY like the checker I had at Walmart #1!” Good to know that even in the fittest state in the nation, there is an adequate supply of the prototypical Walmart checkers. 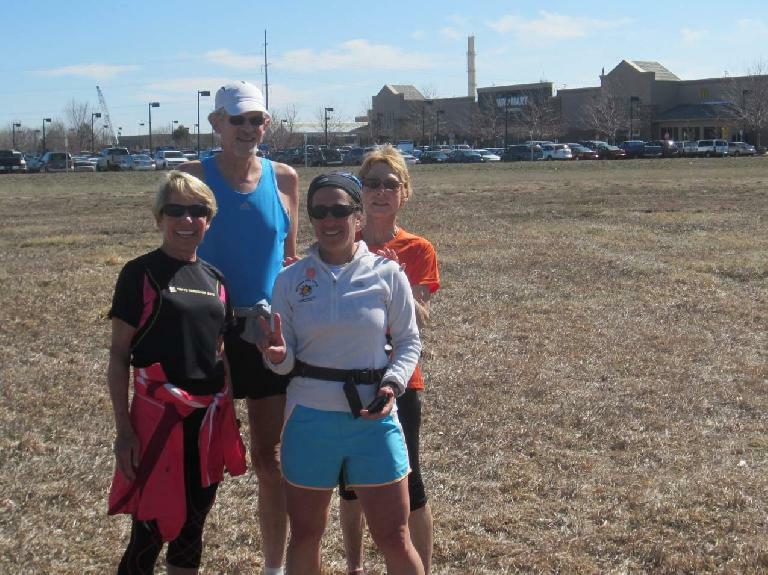 After we escaped from Walmart #2, we jogged along the trail by Boyd Lake in the direction of Walmart #3, located in Timnath. I ran only 3 miles with Alene and Tom before turning back, but it was enough to diminish any lingering Walmart discomfort. You might even say I became less Walmart-phobic after this tour. Just don’t ask me when I’ll be venturing into a Wally Land next. From Alene’s house to Walmart #1 on Hwy 287 & 65th street in north Loveland. 7:30 a.m. start. Approx. 18 miles. From Walmart # 1: go east under the bike path underpass and take the bike path east, cross County roads 13 and 11, then turn left on County Rd 11, go north a few yards, then proceed east on Boyd Lake bike path, which turns south through Boyd Lake State Park and into Loveland. 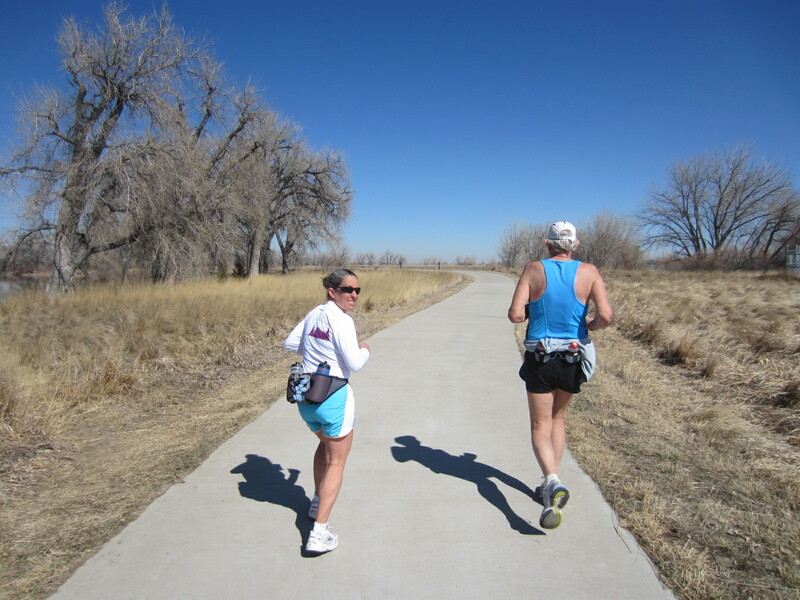 Follow the mileposts (every 1/4 mile). At the south end of Boyd Lake State Park, make a sharp left to continue on the bike path, eventually this ends up at 18th St. & Denver in Loveland. Cross 18th Street and keep going south on Denver, turn right just after the canal (before Eisenhower) and continue on bike path under Eisenhower. At approximately milepost 22 you’ll be facing Walmart. Proceed across the grass to make a beeline for Walmart # 2 at Denver & Eisenhower (Hwy 34)Distance: Approx. 7.5 miles. 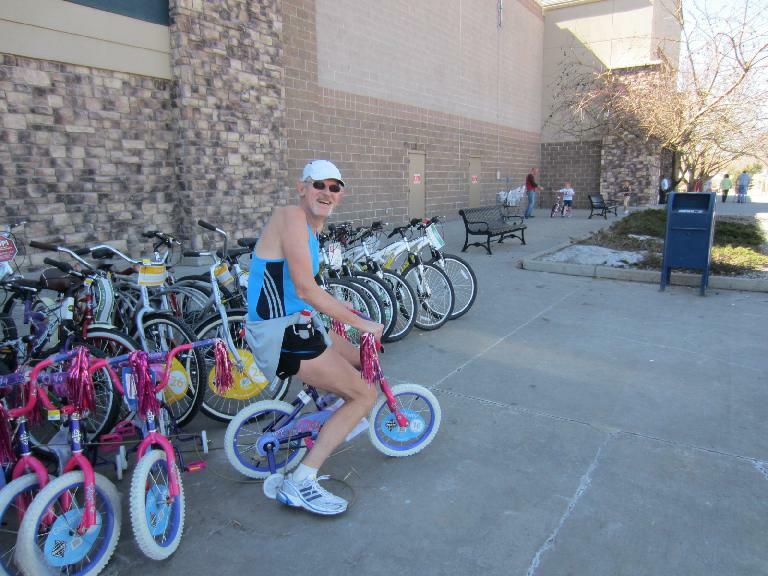 ETA 11:30 a.m.
From Walmart # 2, go back across the grass and run Leg 2 in reverse until the end of the Boyd Lake bike path section at County rd. 11. (just after milepost 42). Turn right on CR 11, go to CR 30, turn right, then turn left onto CR 11 (Timberline Rd.) Take Timberline Rd. north on bike lanes and sidewalks to Kechter Rd. (about 3 miles). Turn right on Kechter, go to Strauss Cabin Rd (CR 7) and turn left (north) on CR 7 to Harmony Rd. Cross to the north side of Harmony rd. and turn right (east) on Harmony. Go east across the overpass of I-25 (be careful!) and you will see Walmart # 3. Take the road that turns north off of Harmony into Walmart and find a safe route across the parking lot to Walmart # 3. ETA: 2:30 p.m. Approx 13 miles. From Walmart # 3, go back across I-25 on harmony and turn north on CR 7 (Strauss Cabin Rd.). Go north to Horsetooth, turn west on Horsetooth, go west to Ziegler, turn right on Ziegler, going north to Environmental Drive, and follow the road to the Environmental Learning Center. 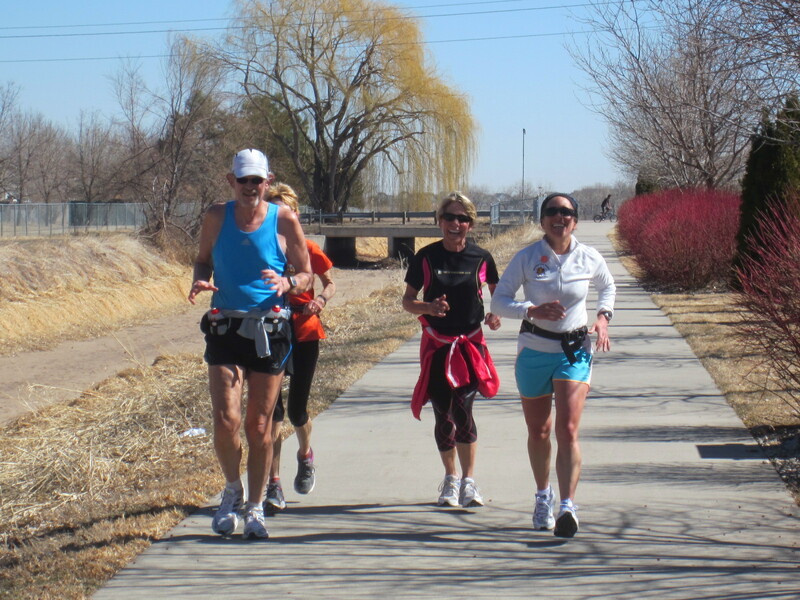 Take the Poudre Trail bike path all the way into town, past the Spring Creek bike path turnoff, continue on Poudre Trail until you cross under Lemay Ave and run up the steep hill which leads to the turn north across the bridge. Run north along the bike path alongside Lemay and cross under Mulberry (Hwy 14) on the bike path. At the northwest corner of the intersection of Lemay & Harmony, proceed north on the sidewalk to Walmart # 4 at Magnolia & Lemay. ETA: 4:30-5 p.m. Approx. 9.2 miles.